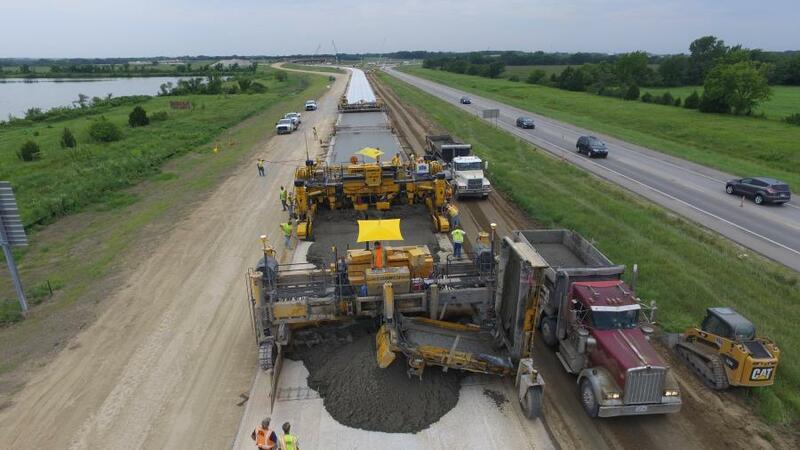 The American Concrete Pavement Association (ACPA) has presented its Sustainable Practices Recognition Award to Emery Sapp & Sons, Inc. (an ACPA Member) and the Kansas Department of Transportation for their team effort in recognizing and prioritizing sustainable construction practices on the South Lawrence Trafficway (K-10) Project. In addition to the complexity of building a six-mile, four-lane highway on new alignment, the contractor and agency's combined efforts successfully employed context sensitive measures in the truest spirit of sustainable construction. The award recognized some extraordinary actions, including clearing and grubbing by hand to protect the local ecosystem, such as plants and animals in the Baker Wetlands. The award also cited the innovative spirit — including use of stringless paving, recycled timber mats and a forward-thinking approach to foundation stabilization — which underscored the use of both modern technology and old-fashioned hard work and ingenuity. Finally, the award recognized the contractor and agency for their lasting work, which provides a well-designed, long-lasting highway, while also meeting the delicate need for ecological balance in the wetlands.